The Coen brothers are my favorite working directors. Their vision, humor, and ability to tell a story is simply fasinating. They have yet to not impress me with every film they make dating all the way back to Raising Arizona. 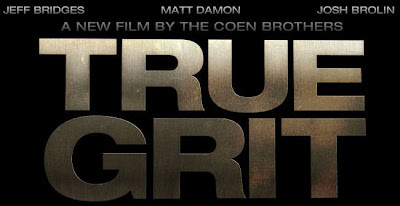 Based off the first trailer for their upcoming retelling of the classic western "True Grit," the Coen's are back once again with another piece of cinematic history. "True Grit" is set to release Christmas Day and stars Jeff Bridges, Matt Damon and Josh Brolin. The official synopsis: Fourteen-year-old Mattie Ross's (Hailee Steinfeld) father has been shot in cold blood by the coward Tom Chaney (Josh Brolin), and she is determined to bring him to justice. Enlisting the help of a trigger-happy, drunken U.S. Marshal, Rooster Cogburn (Jeff Bridges), she sets out with him -- over his objections -- to hunt down Chaney. Her father's blood demands that she pursue the criminal into Indian territory and find him before a Texas Ranger named LeBoeuf (Matt Damon) catches him and brings him back to Texas for the murder of another man. Below I've included a few screen captures from the released trailer. Head over to Apple Trailers to see the full trailer for yourself in glorious HD.